This article is about the Babylonian god. For the Swedish black metal band, see Marduk (band). For other uses, see Marduk (disambiguation). Marduk (cuneiform: 𒀭𒀫𒌓 dAMAR.UTU; Sumerian: amar utu.k "calf of the sun; solar calf"; Greek Μαρδοχαῖος, Mardochaios; Hebrew: מְרֹדַךְ, Modern: Mərōdaḵ, Tiberian: Merōḏaḵ) was a late-generation god from ancient Mesopotamia and patron deity of the city of Babylon. When Babylon became the political center of the Euphrates valley in the time of Hammurabi (18th century BC), he slowly started to rise to the position of the head of the Babylonian pantheon, a position he fully acquired by the second half of the second millennium BC. In the city of Babylon, Marduk was worshiped in the temple Esagila. Marduk is associated with the divine weapon Imhullu. "Marduk" is the Babylonian form of his name. The name Marduk was probably pronounced Marutuk. The etymology of the name Marduk is conjectured as derived from amar-Utu ("immortal son of Utu") or ("bull calf of the sun god Utu"). The origin of Marduk's name may reflect an earlier genealogy, or have had cultural ties to the ancient city of Sippar (whose god was Utu, the sun god), dating back to the third millennium BC. By the Hammurabi period, Marduk had become astrologically associated with the planet Jupiter. Marduk's original character is obscure but he was later associated with water, vegetation, judgment, and magic. His consort was the goddess Sarpanit. He was also regarded as the son of Ea (Sumerian Enki) and Damkina and the heir of Anu, but whatever special traits Marduk may have had were overshadowed by the political development through which the Euphrates valley passed and which led to people of the time imbuing him with traits belonging to gods who in an earlier period were recognized as the heads of the pantheon. There are particularly two gods—Ea and Enlil—whose powers and attributes pass over to Marduk. In the case of Ea, the transfer proceeded pacifically and without effacing the older god. Marduk took over the identity of Asarluhi, the son of Ea and god of magic, so that Marduk was integrated in the pantheon of Eridu where both Ea and Asarluhi originally came from. Ea, Marduk's father, voluntarily recognized the superiority of the son and hands over to him the control of humanity. This association of Marduk and Ea, while indicating primarily the passing of the supremacy once enjoyed by Eridu to Babylon as a religious and political centre, may also reflect an early dependence of Babylon upon Eridu, not necessarily of a political character but, in view of the spread of culture in the Euphrates valley from the south to the north, the recognition of Eridu as the older centre on the part of the younger one. While the relationship between Ea and Marduk is marked by harmony and an amicable abdication on the part of the father in favour of his son, Marduk's absorption of the power and prerogatives of Enlil of Nippur was at the expense of the latter's prestige. Babylon became independent in the early 19th century BC, and was initially a small city state, overshadowed by older and more powerful Mesopotamian states such as Isin, Larsa and Assyria. However, after Hammurabi forged an empire in the 18th century BC, turning Babylon into the dominant state in the south, the cult of Marduk eclipsed that of Enlil; although Nippur and the cult of Enlil enjoyed a period of renaissance during the over four centuries of Kassite control in Babylonia (c. 1595 BC–1157 BC), the definite and permanent triumph of Marduk over Enlil became felt within Babylonia. The only serious rival to Marduk after c. 1750 BC was the god Aššur (Ashur) (who had been the supreme deity in the northern Mesopotamian state of Assyria since the 25th century BC) which was the dominant power in the region between the 20th and 18th centuries BC, and between the 14th to the late 7th century BC. In the south, Marduk reigned supreme. He is normally referred to as Bel "Lord", also bel rabim "great lord", bêl bêlim "lord of lords", ab-kal ilâni bêl terêti "leader of the gods", aklu bêl terieti "the wise, lord of oracles", muballit mîte "reviver of the dead", etc. When Babylon became the principal city of southern Mesopotamia during the reign of Hammurabi in the 18th century BC, the patron deity of Babylon was elevated to the level of supreme god. In order to explain how Marduk seized power, Enûma Elish was written, which tells the story of Marduk's birth, heroic deeds and becoming the ruler of the gods. This can be viewed as a form of Mesopotamian apologetics. Also included in this document are the fifty names of Marduk. Then, he proceeds to defeat Kingu, who Tiamat put in charge of the army and wore the Tablets of Destiny on his breast, and "wrested from him the Tablets of Destiny, wrongfully his" and assumed his new position. Under his reign humans were created to bear the burdens of life so the gods could be at leisure. Babylonian texts talk of the creation of Eridu by the god Marduk as the first city, "the holy city, the dwelling of their [the other gods'] delight". However, Eridu was founded in the 5th millennium BC and Marduk's ascendancy only occurred in the second millennium BC, so this is clearly a revisionist back-dating to inflate the prestige of Marduk. Leonard W. King in The Seven Tablets of Creation (1902) included fragments of god lists which he considered essential for the reconstruction of the meaning of Marduk's name. Franz Bohl in his 1936 study of the fifty names also referred to King's list. Richard Litke (1958) noticed a similarity between Marduk's names in the An:Anum list and those of the Enuma elish, albeit in a different arrangement. The connection between the An:Anum list and the list in Enuma Elish were established by Walther Sommerfeld (1982), who used the correspondence to argue for a Kassite period composition date of the Enuma elish, although the direct derivation of the Enuma elish list from the An:Anum one was disputed in a review by Wilfred Lambert (1984). The Marduk Prophecy is a vaticinium ex eventu text[a] describing the travels of the Marduk cult statue[b] from Babylon. It relates his visit to the land of Ḫatti, corresponding to the statue's seizure during the sack of the city by Mursilis I in 1531 BC, Assyria, and when Tukulti-Ninurta I overthrew Kashtiliash IV, taking the image to Assur and Elam in 1225 BC. Kudur-nahhunte then ransacked the city and pilfered the statue around 1160 BC.[who? ]Kudur-nahhunte addresses an assembly of the gods. The first two sojourns are described in glowing terms as good for both Babylon and the other places Marduk has graciously agreed to visit. The episode in Elam, however, is a disaster, where the gods have followed Marduk and abandoned Babylon to famine and pestilence. Marduk prophesies that he will return once more to Babylon to a messianic new king, who will bring salvation to the city and who will wreak a terrible revenge on the Elamites. This king is understood to be Nabu-kudurri-uṣur I, 1125-1103 BC. Thereafter the text lists various sacrifices. A copy was found in the House of the Exorcist at Assur, whose contents date from 713-612 BC and is closely related thematically to another vaticinium ex eventu text called the Shulgi prophecy, which probably followed it in a sequence of tablets. Both compositions present a favorable view of Assyria. During the first millennium BC, the Babylonians worshipped a deity under the title "Bel", meaning "lord", who was a syncretization of Marduk, Enlil, and the dying god Dumuzid. Bel held all the cultic titles of Enlil and his status in the Babylonian religion was largely the same. Eventually, Bel came to be seen as the god of order and destiny. The cult of Bel is a major component of the Jewish story of "Bel and the Dragon" from the apocryphal additions to Daniel. In the account, the Babylonians offer "twelve bushels of fine flour, twenty sheep, and fifty gallons of wine" every day to an idol of Bel and the food miraculously disappears overnight. 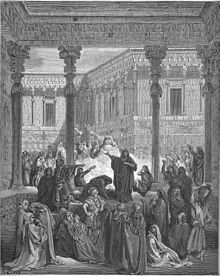 The Persian king Cyrus the Great tells the Jewish wise man Daniel that the idol is clearly alive, because it eats the food that is offered to it, but Daniel objects that it "is only clay on the inside, and bronze on the outside, and has never tasted a thing." Daniel proves this by secretly covering the floor of the temple with ash. Daniel and Cyrus leave the temple and, when they return, Daniel shows the king the human footprints that have been left on the floor, proving that the food is really being eaten by the seventy priests of Bel. Bel is also mentioned in the writings of several Greek historians. This article incorporates text from a publication now in the public domain: Chisholm, Hugh, ed. (1911). "Marduk" . Encyclopædia Britannica (11th ed.). Cambridge University Press. ^ identified with Marduk by Heinrich Zimmeren (1862-1931), Stade's Zeitschrift 11, p. 161. ^ a b Helmer Ringgren, (1974) Religions of The Ancient Near East, Translated by John Sturdy, The Westminster Press, p. 66. ^ Frymer-Kensky, Tikva (2005). Jones, Lindsay, ed. Marduk. Encyclopedia of religion. 8 (2 ed.). New York. pp. 5702–5703. ISBN 0-02-865741-1. ^ Arendzen, John. "Cosmogony". The Catholic Encyclopedia, 1908. Robert Appleton Company. Retrieved 26 March 2011. ^ C. Scott Littleton (2005). Gods, Goddesses and Mythology, Volume 6. Marshall Cavendish. p. 829. ^ Morris Jastrow (1911). Aspects of Religious Belief and Practice in Babylonia and Assyria. G. P. Putnam’s Sons. p. 38. ^ Matthew Neujahr (2006). "Royal Ideology and Utopian Futures in the Akkadian Ex Eventu Prophecies". In Ehud Ben Zvi. Utopia and Dystopia in Prophetic Literature. Helsinki: The Finnish Exegetical Society, University of Helsinki. pp. 41–54. ^ a b Fontenrose 1980, p. 440. ^ a b c d e f Doniger 1990, p. 120. ^ Wills 2002, p. 53. ^ a b c d Wills 2002, p. 58. ^ Wills 2002, p. 59.